Many, many people, particularly those whose faith he held, could speak volumes about the glories of Aindra prabhu and possibly give us glimpses into the internal life he cultivated. I will not pretend to know much about him. But I, like many, had a few interactions with him, held some appreciation for his convictions, and feel that his passing is a great loss for the Vaisnava community. My first encounter with Aindra was through his Vrindavana Mellows tapes in the early 90s. In our brahmacari asrama we would listen to them often and learn many of the melodies. In 1995, ’96, and ’98, while in Vrindavana, I was able to participate in several of his kirtanas and associate with some of his kirtana crew. Visiting his room was like stepping into some medieval babaji‘s cave: walls plastered with cow dung, a maha-prasad Tamal tree from the courtyard of the mandira, uncountable salagram silas… And then there was the twenty-first century recording equipment with which he expertly demonstrated yukta-vairagya, working his magic to engineer transcendent sound. I fondly remember gathering with his gang on the veranda outside his room as they belted out a chorus response for his latest recording Prayers to the Dust of Vraja. In that room, the life, the kirtana-rasa, the bhava I had heard in those recordings came alive before my eyes. There were the instruments—the bells that you hear ringing in Mellows recordings, swarmandala, and the ankle bells he wore on his feet as he would pound out rhythm while simultaneously playing harmonium and bellowing forth commanding kirtana… While residing in that tiny little corner of Vraja-dhama, he was broadcasting its environment all over the world. As a kid I used to sing and play music in punk bands. The art of music is in expressing the passion of the soul. I had an attraction to kirtana because it was the highest, most complete form of self-expression. Aindra’s kirtanas always made me feel self-expressed, feeling the mood of saranagati to Sri Krishna in the form of Sri Nama prabhu. I’ve always felt that just as we consider the consciousness of the chef entering the food that he or she prepares, the mood of the kirtaniya is manifest in their presentation of kirtana. Kirtana with Aindra in Vrindavana was always focused, absorbing, and emotionally rich. You never felt inattentive because his fervor for the name kept you present. He was a master of rhythm and synchronicity. He would bark commands of his intentions in changing the flow. Often he would give a soul-piercing stare, looking like a madman. He wanted you there, in Nama, in congregation. Never for a minute did I feel pratistha in his kirtana. As I consider what influence he had on my life, I think that what I appreciate the most about Aindra prabhu was his contribution to the diversity of Iskcon. His eccentric nature, unkempt look, crazy brown cloth, his frustration with the status quo, and his nature to periodically boil over and without restraint speak in such a way as to be censured by authority. He was anything but a generic Hare Krishna devotee. He was someone who was prodding his associates, his community, and his gurudeva’s mission to move, progress, advance! Can’t you hear him yelling now?! His “settle for nothing less” sense of urgency was contagious. It is most unfortunate that Iskcon has many times been unable to appreciate or accomodate such diversity, particularly in those fortunate souls like Aindra prabhu who develop an attraction and pursuit of raga-marga and who desire to assist their brethren by sharing their realization. I have it on good authority that Aindra had recently published a book of his realizations. After making an offering at Srila Prabhupada’s tirobhava mahotsava last year, he was once again rebuked and told that if his book was published he would have to leave Iskcon and give up his most cherished sankirtana service. Although he did publish at least one for himself, I have heard that in desiring to keep this service, his thought was that his book would have to wait until after his death to be available to the masses. It is most tragic that the spiritual progress of an influential person could be seen as a management problem rather than an opportunity for reassessing, re-evaluating and re-prioritizing the purpose of Srila Prabhupada’s mission. Aindra prabhu certainly had some biting words to say in this regard. While some may not agree with his philosophy or his style of presentation, the silencing of dissent, either through threat of excommunication or through the unfortunate demise of the dissenter is most disappointing to those who yearn for truth. Spiritual progress is by nature a highly individualized affair, and its presentation in a worldwide society of varying degrees of adhikara is most definitely a challenge. However, I hope that before facing more of these unfortunate circumstances, Iskcon can learn to at least accomodate, but better yet, to advocate, for the individual development of its membership, considering the accompanying management dilemma only secondarily. All glories to Hari-kirtan-rasacarya Sripad Aindra prabhu! Wherever you heard about the book he wrote – it is correct. I met the editor at a memorial service for Aindra Prbhu. It is also true that he was threatened with excommunication if the book was published and that his life and soul was his kirtana seva, which he was unwilling to lose due to distributing his book. From everything I heard it seems that he was full to conviction and love for Krsna nama. May we all be blessed with even a small portion of his conviction and dedication to Sri Nama Prabhu. Thank you for sharing your reflections. I do appreciate it. One thing I find curious, and *please* correct me if I am wrong…because I am often misinformed on these things, but I thought Aindra Prabhu was really *anti* anyone outside of Iskcon. Or maybe a better way to say it is that he was very unhappy with people who left the Iskcon institution. Honestly, I don’t know how to precisely express the impression I have. But I was told that after the disappearance of my husband’s guru, Aindra Prabhu publicly spoke at a memorial for Srila Gour Govinda Swami chastising his disciples for leaving Iskcon. So this is what I am basing that idea on. I am not debating his unmatchable contribution as a contemporary glorifier of the Holy Name. Nor am I trying to be disrespectful while so many are feeling great loss. His death was truly tragic for various reasons. I just wonder, in all sincerity, about the contradiction of using Prabhu as an emblem of institutional unity when I am just unclear of his position on what I mentioned above. Very interested in hearing from you, or anyone else, about your thoughts on this. I am in no position to speak about his feelings of loyalty towards Iskcon, or what he thought of people leaving. I really don’t know. You can read in the quote I reference below that he certainly challenged the status quo in Iskcon and was evidently placing his own status within the institution in a precarious position. Who can say what may have happened in the future? We know from history that others on similar paths have been either forced out or left Iskcon of their own accord. Others have passed from our vision before we knew how the “problem” would be resolved. Hence the management vs. spiritual growth dilemma I bring up. I see no disrespect in your inquiry. People are complex. Spriritual people even more so. I think it is very respectful to acknowledge the whole of who Aindra prabhu was. This is one side of him that I held much appreciation for. That means he was an avadhuta. He didn’t need any particular costume or ashram to falsely identify with. The “GBC” had no business inquiring about his ashram or varna as Aindra prabhu was beyond all such mundane designations. The GBC should have kept his nose out of such personal matters. These buffoons will have to answer for these things in the future. Just another good example of how the GBC has become nothing more than a gang of thugs shaking down every new devotee that walks in the door and sending all the original disciples OUT THE DOOR! I served side by side with Aindra prabhu on the altar of the Chicago temple for about a year and got quite close to him in my early years in ISKCON Chicago. He was pujari for Jagannatha, Baladeva and Subhadra and I was pujari for Gaura-Nitai. I never imagined he would go on to be such a great sadhaka with such a wonderful career in KC. He lived the lifestyle that I can only dream of. Apparently, his special quality of love and devotion was needed to fill a position in the Lord’s lila somewhere so he was taken away. Aindra prabhu always had a special kind of youthful innocence. Of course the conspiracy theorists have already started to speculate about a possible assassination of Aindra prabhu. It sounds every bit like an accident to me. In the USA they make gas companies add onion and garlic oil to the bottled gas to make it detectable by smell in case of leak. I don’t know if they do that in India, but it doesn’t appear so or otherwise Aindra prabhu would have smelled the gas vapors. I don’t doubt the least that Aindra prabhu in now preparing to take birth in Gaura-lila in some universe on some planet where the pastimes of the Lord are being enacted. Final ascension to Goloka will occur after that. This is the process of entering the eternal pastimes of Krishna. It has been many years since I was a close associate of Aindra prabhu, but I still feel the loss. ISKCON lost one of her best with the passing of Aindra prabhu. He will be sorely missed, but his passing will not go without causing the feelings of separation of everyone who knew him and loved him. All the comments on Aindra Prabhu remind me of Ronald Nickson aka Krishna Prem ( ref: ” Bharater Sadhak by Prabodh Kumar Sanyal) . Though I have been to Mayapur a number of times, I am in no way connected with ISKCON or any other religious organisation but I have a great reverence for those who left their country, religion , friends and families to live the life of a sadhaka or sannyasi in a far-off country. It is not possible for a commoner to confront death in such a mundane manner – though we come across such instances in Tagore’s work . Not everyone can acquaint death with Krishna ( ” morono re tuhu momo shyamo soman”). Still still I feel if someone could have prevented his death. Here is the YouTube video of his funeral. It is very touching to see the devotees in such separation from Aindra prabhu. Everyone will weep watching this video. We must always remember – It is not that authority constitutes truth. Truth constitutes authority. That is guru-parampara. They who prefer to bend, water down, compromise, or obscure the truth to suit various inveigling materially conceived managerial agenda on the plea of propagating the Krishna consciousness movement are not truthful Brahmins, what then of being paramahamsa Vaishnavas. It is disgraceful to remain a fallible neophyte. It is not enough that children pretend to be adults ad nauseum on the plea of perpetuating the sampradaya. Sand-box make-believe-world half-baked mud-pie “Krishna consciousness” will not do. Vaidhi bhakti, though useful to a limit, is like licking the outside of a jar of honey. Srila Bhaktisiddhanta Sarasvati Prabhupada says so. Our ISKCON founder-acarya, A. C. Bhaktivedanta Swami Prabhupada, echoes the same instruction. Therefore, I am compelled to press this most essential point. We have to make progress. Jiva jago! Jiva jago! We have to open the honey jar and actually taste the honey. That is raga-marga-bhajana-kirtana, that is real sadhu-sanga, and that is true para-upakara. Mere lateral expansion of the institution’s workforce, notwithstanding the society’s unspeakable membership turnover, does not in and of itself constitute progress of the Krishna consciousness movement. Movement means to scientifically and consciously move ourselves and those who depend on us for spiritual inspiration toward the very legitimate goal of vraja-prema. Thanks for replying, Madan. Truthfully, I can’t understand what you are saying. I guess I am just pregnant and really tired. Will read it again tomorrow and try to make sense of it. Hope you are doing well. How a person could have this kind of realization and remain in an institution that so blatantly goes against spirituality in so many ways is beyond me. He did not always have the realization. He had his sectarian days, but towards the lamentable end he left that behind and thus became suspect. I think the answer is that one cannot, at least not more than formally for a while. And he left, for whatever that is worth. Then there are people like me and others who don’t like institutions per se and then so we are called rugged individuals who don;t like authority. So some people accept institution as necessary evil. I have never seen a big religious institution that is successful in keeping genuine quality. What does one do go alone and be castigated for being rebellious or stay and be told that how he is inside an institution? The choice is easier said than done. I don’t understand why you are so surprised. It is a tough decision. Anybody who tries to be non-sectarian is blamed for not taking the war to the “mayavadis/etc”? Do we carry out a war on superficial faith? 99.9% people have no deep realization of their own faith and they are so convinced about the absolute nature of their faith that they can speak against all other faiths on the strength of their “great” faith in selective sastra. This to me is a greater problem than people sticking to an institution. I would rather think that he was just very much attached to his seva… He was such a famous person that there would be no problem for him to survive outside Iskcon. Every other temple in Vrindavan would accept him immediately had he been kicked out. Or he could sit under the tree behind the gate and people would go there to hear his singing. I find it one-sided of you to claim that Iskcon “blantly goes against spirituality in so many ways.” Devotees remain in Iskcon for many reasons, and Aindra Prabhu remained in the institution and made it a better place. Despite his not having any title or managerial support he inspired thousands of devotees on a very deep spiritual level. And he spoke out on the lack of spiritual substance that he saw, and though many in management positions didn’t like what he said, many many devotees within Iskcon heard what he said and took those things to heart. There is much that is alive and spiritually vibrant within Iskcon on a grass-roots level. For some devotees the solution to problems in Iskcon isn’t always to leave it. Having said that, I also feel that Iskcon does not properly accommodate devotees of Aindra Prabhu’s caliber, and that this year in particular was more rough for him politically. And as Gurumaharaj has pointed out, yes he has now left. To the great loss of all of us, especially Iskcon devotees. I don’t think it would be difficult (or even necessary) to defend the claim that Iskcon goes against spirituality in a number of ways. That has, in my opinion, nothing to do with whether or not people are inspired by someone like Aindra. By your own admission the institution doe not properly accommodate devotees of his caliber–that being the case I wondered why he would stay. Guru Maharaja gave a reasonable answer, as did Braja-sundari. Fair enough. At a grass roots level there may well be a measure of spiritual vitality; I was more alluding to the structural level, which is a total mess. Is that so difficult to accept? I know it’s not for everyone, but to my way of thinking if I was for example told not to publish my book because it was critical of the (clearly un-spiritual) policies of the leadership that would be a good enough signal to me that it was time to move on. To me the leaving of such a prominent person would be a bigger wake-up call for many than to stay and try to effect change from within the corrupt structure of censure and control. But to each his own. Well Aindra Prabhu showed his love and respect to Srila Prabhupada and his God brothers and GBC by not leaving ISKCON. Though publishing and distributing his book was vital for him. He stuck to Prabhupadas words if you love me then you will show your love by staying on. He was truly a highly elevated self-realised soul who had attained love of Sri Sri Radha Krishna. Rest all material. Aindra had no respect for his institutions (Iskcon’s) leadership (GBC) and that is abundantly clear form his book. He was never involved in publishing and distributing books other then his own book. Those were not Prabhupada’s words. Here you make a subjective call and inappropriately criticise those who left Iskcon for spiritual reasons. And I personally knew Aindra for many, many, years in the position of one of his spiritual advisors. I heard Aindra Prabhu`s offering on Srila Prabhupada`s disappearance day in 2006. It was very similar in mood… Every speaker was allowed to talk for 5 minutes. After 10 minutes the person who had the list of speakers told him to stop. Aindra Prabhu got very angry. “I have something important to say and I will say it. You don`t allow me to speak otherwise but this is my spiritual master`s disappearing day. Do not disturb me any more” and he continued for maybe 15 minutes more. Few days later he gave a class (I guess someone wanted to change the image of temple authorities in the eyes of thousand devotees who heard that Aindra Prabhu is not allowed to give classes) and it was as nice as his kirtans, obviously far beyond mere repeating of verses and stories. I don’t think I ever met Aindra. In only know him through his recorded kirtans and his talks. Like Madan Gopal, I lament the institution’s perceived need to rein in devotees whose experience in Krishna consciousness doesn’t fit well into the what its leaders feel they can manage. (Like so many of my brothers and sisters, I’ve also encountered that from time to time over the years.) But I don’t think that devotees whose lives are taken over by their realizations can be managed, or that they’re meant to be managed. Certainly the GBC found Gour Govinda Maharaja hard to manage. But Srila Prabhupada encouraged unity in diversity. The rest of us should also not only encourage it but celebrate it. Lol! I just realized that what you posted was a quote from Aindra. I am ROFLMAO because I really was like, “huh?” Now it makes a little more sense to me. Okay. Wish I could nap but literally, it is time to make the donuts. Okay. I’ve recovered from my bout of hysteria. It is a nice quote, but I don’t really think it addresses the question I asked; that is okay since I don’t hold you personally responsible for providing an answer. I dont think the quote was actually intended as a response (but there is a separate response now). I think the quote was submitted before your original question was approved. So it looks like it came in as a response, but it was just a later comment. Yes deva, please see your original comment above. My reply is there. I submitted the quote from Aindra on my own, before knowing/reading your question. I am finding everyone’s posts interesting and do appreciate the sentiment that the posters here are looking for a genuine spiritual experience and find Aindra Prabhu an example of a kindred heart. I am not privy to all the message boards and com discussions going on online and I am not trying to be disrespectful. I’m not. Personally, I am not affected by Aindra Prabhu’s passing for different reasons, the first of which is my Hare Krishna identity has kind of fallen into a secular pit and I am okay with that. So I admit that I my perspective on Prabhu is respectful but in no way reverential. I’m just wondering if, other than the official statement posted to the Old Chakra in 2000, there has been any other mention–possibly more recent–of the 1999 Appearance of Radha Kund incident that occurred at the KB Mandir. I was in the temple room that day and it wasn’t really…nice. I know Aindra Prabhu had some unique opinions about women (which no one seems to be publicly talking about at this time) and it seems some of those came to a head that morning when violence against women by Iskcon devotees took place in front of Radha Syamasundara’s altar. Of course, Prabhu did not personally assault anyone. But he was, from my understanding, he was one of the main organizers of the events leading up to the altercations. Sure, someone could say that was more than 10 years ago, but wow…I personally lost a lot of appreciation for his kirtan after that (I know, I know, who the hell am I? Who cares? I am not so concerned about those questions but can understand if someone less secular than I turns down my inquiry as aparadha.). And I guess the secular school girl in me has the question, “Is it ever appropriate to critically reflect upon the life of a Vaisnava, particularly a Vaisnava whom the masses declare is a pure devotee?” I am not really interested in any kind of judgement, positive or negative, about who goes where after death. But I am interested at looking at people’s lives and examining that legacy. As Gaurangi-priya accurately points out,”he inspired thousands of devotees on a very deep spiritual level.” So that legacy is there and is and will be properly glorified. But is there room within a devotional community to talk about some alternative narratives? Does that, within our culture, automatically become an offense? Or is there room to look at a great sadhaka’s life with grown-up, open eyes so that aspiring practitioners can learn from the non-examples/mistakes that most humans commit over the course of a lifetime. I guess I am just more touched/moved/affected by human portrayals, warts and all, of people. Are devotees people? When they die (sorry, I’ve shed most of the jargon from my lexicon), it seems that hardly anyone has led a mortal life. Is it just me or does this treatment do a disservice to glorifying the deceased? I find it profoundly more moving when *real* people with *real* struggles attain some kind of greatness–be it spiritual or mundane. Is it an offense to humanize Aindra? I had personal experience of escaping from the temple because some crazy ladies started really annoying dance in front of Radha Syamasundara (for sure the pleasure of the deity was not their intention)and tried to force me to join them. I don`t know, but maybe these ladies were frequently doing that and this was one of the reasons why this later incident occured. true he looked on any person whether man or woman as a soul. Thanks for your thoughts deva, you articulate them very well. But is there room within a devotional community to talk about some alternative narratives? Does that, within our culture, automatically become an offense? I think the answer to your questions lies in who you surround yourself with, who you call community. In other words, different people, possessing different adhikara will respond to such topics differently. Thakur Bhaktivinoda characterizes the madhyama as “plagued with religious doubt”. Critical thinking is a sign of progress. Though it may appear as a lack of faith, in actuality it is a building of a more solid foundation for faith to rest upon. Bhaktivinoda also very wisely points out that the kanistha and the madhyama cannot relate with each other. The nature of their thinking is too different and therefore incompatible. I see and experience this all the time with devotees having difficulty relating based on the relative maturity of their faith. I think the stage you find yourself in as it relates to your faith and practice is a common one, indicative of progress, though it may not feel like it. I definitely don’t think it offensive to humanize anyone. I hope that my article and comments reflect that. Wow,thankyou for saying that(not in reference to my beloved hero Aindra dasa)! I think you will find that people in any sphere of live tend to reflect on the positive side of a persons life when they die. That doesn’t mean that a person didn’t have any negative qualities, it just means that people in general tend to think graciously about those who pass on. I see your point and I think it is quite valid. It is incredibly relevant if devotees want to truly learn and improve themselves and the communities in which they live. Since I am unaware of the incident that you are talking about and Aindra’s involvement it’s hard for me to say much – but I will say that, personally I feel that someone who has developed deep love for Hari Nama Prabhu will automatically develop love for all others regardless of body type. It may be that Aindra was influenced in his thinking by the culture around him, his upbringing, or a myriad of other things. We are told that just as the ganges may appear polluted (and that is certainly the case) it remains pure similarly a pure devotee may have defects in the body or mind yet we should still see their purity. To take it a step further – we may be able to identify the source of pollution in the ganges and by doing so we may also be able to rectify that pollution – in the same way defects in the body or mind of a pure devotee may be able to be diagnosed and source found so that the defect can be corrected. These remedies will help those with a less developed sense of spirituality to see the purity in both the river and the body of the devotee. These remedies will not, of course, alter the innate spiritual purity of either. It is wonderful that Aindra inspired so many, but it is sad that his actions or inactions made you loose appreciation for his kirtana. It is that type of honest reflection that can help all of us grow. As servants of Sri Nama Prabhu we want to bring people to his lotus feet, not push them away. So I admit that my perspective on Prabhu is respectful but in no way reverential. And I think that is fine. He doesn’t have to speak to everyone’s faith. And there is a difference between appreciation and faith. I appreciated him a lot, particularly for his non-conformity. I think as Audarya-lila pointed out, the spiritual substance of a devotee will always outshine any material blemishes they may possess. His efforts towards attaining spiritual perfection were admirable, inspiring and quite possibly ultimately successful. It appears that Aindra prabhu’s leaving us helps us think about what matters most, what really matters. It is an apparent fact that we cannot discover the value of someone we rub elbows with -as a figure of speech- until that person leaves us. Why can’t we be more generous with others and learn to look for the honey (as Srila Prabhupada said: “The bee looks for the honey and the fly for the dirt.” Just paraphrasing…)? We live in a confusing world. That is the macrocosm of sorts, the microcosms being these little units of conscious agreements. But there is no perfection in the world of matter, period. We may belong to this group, to that group or to no group, but still our individual perceptions will lead us to act in ways that will help build or destroy. There is work to be done; namely to work on our own selves, to pray to become instruments of kindness, comfort and encouragement, and to BEG to the divine grace to allow us to be of service. If we knew we were going to live just a few more days, how would we spend out time? How do we know we have plenty of time to accomplish so many things…? What is there to be learned from this instance? What is to be learned at every step, with every second of our lives? Is Krsna not talking to us ALL the time? Are we willing to listen? [I]s there room within a devotional community to talk about some alternative narratives? Does that, within our culture, automatically become an offense? Or is there room to look at a great sadhaka’s life with grown-up, open eyes so that aspiring practitioners can learn from the non-examples/mistakes that most humans commit over the course of a lifetime. I think it’s natural to speak of him as a human, because that’s what he was. He had things he liked and things he disliked. He had moods, maybe transcendental, maybe not. What may inspire us most is his struggle to attain his aspiration of becoming acutally Krishna conscious. He seems to have made choices to form his life around the phrase “kirtaniya sada harih.” I believe Srila Sridhara Maharaja said that rather than guage others by what they’ve done, we should measure them by their aspiration. I’m a little fascinated by the eulogies, the unreserved praise for Aindra as a perfect vaisnava. Only last week, he was an irritant, threatened with excommunication if he published his book. We saw the same sort of thing when Sripad Gour Govinda Maharaja left our company. For a considerable time his candor made him a pain in the neck to ISKCON’s leadership. Suddenly he was a perfect saint. It seems to some that all we have to do to become pure devotees is to die. Sad commentary on our culture, I think. Although it is considered poor form to criticize those who can’t defend themselves, I think it’s most appropriate to express whatever appreciation we have honestly. Thank you Madan for your post. It is really nice to read your thoughts. The first Vaisnava in the history of The International Society For Krishna Conciousness, to take Babaji Initiation. He ever so clearly was non-human and/or an ordinary ¨woman-hater¨. What he did undoubtedly and vehemently-despise or hate in an individual and/or collectively, was their causeless unwillingness to surrender to the Yuga-dharma of Harinam-Sankirtan. Just wanted to offer my condolences on the loss of your acarya. My deep respects to your continued dedication to his mission and your service. Prabhupāda: Ah, Audolomi dāsa Bābājī. That’s all. Hare Kṛṣṇa. So this is the first time in our institution: a bābājī. So it is not to be imitated. It is the paramahaṁsa stage when one is very mature in sannyāsa life, for that, not for ordinary person. Don’t request, “Give me sannyāsa. Give me bābājī.” Don’t do that. It is not a fashion. It is a stage of realization. That’s all. I was present at the initiation of Audolomi dāsa Bābājī and the circumstances were quite interesting. Audolomi believed for some reason that he had a terminal disease, and told Srila Prabhupada that he would die very soon, perhaps within a year. Then he asked Prabhupada for babaji initiation and permission to die in Sridhama Mayapura. Prabhupada granted his requests and Audolomi donned babaji dress and went off to die in the dhama. Audolomi decided to spend his remaining days at Mayapura Chandradoya Mandir, however week after week went by and he did not die, or even get sick; rather he seemed to get healthier. So he consulted a physician in Calcutta and lo and behold whatever was supposed to have been killing him was no longer a problem. With that news he became elated, discarded his babaji cloth, put on secular clothes, flew back to America and moved back in with his parents. Dristadumna visited him and according to him all Audolomi could say was “I’m not going to die.” I’m not going to die.” To this Dristadumna replied, Are you crazy everyone is going to die. Audolomi’s reply to that was, –But not now! And to my knowledge that was the last anyone heard of Audolomi dasa babaji. Brahma… you are awesome. This story is sadly hilarious. I also did not know Aindra very well. I saw him in Vrindaban every year and danced in the kirtans, and once or twice saw the inside of his room. After his departure I have taken the time to listen to any classes or speeches he gave that are available on-line and have felt great inspiration by his words which seem inspired and pure. His disappearance reminds me of the disappearance of Srila Gour Govinda Maharaja in its suddenness & glory; and in how he is being greatly honored in the aftermath of his departure, whereas he was under apparent threat before his disappearance. Seeing his face in kirtan and hearing his words, one cannot help but feel that here is a soul who is tasting the divine and is eager to share that taste with everyone. Fortunately, Aindra is living still in sound here with us, and he has undoubtedly attained the lotus feet of Lord Nityananda to continue with Samkirtan forever. I was there also (and I’m still alive), but I remember things differently. I was in Mayapura in a thatched hut, in a banana grove on the Ganges. Everybody in ISKCON even those who earned my undying respect was falling at my feet when ever they saw me. I was being treated with great respect as if I was a holy man, but I felt so undeserving and all I ever wanted was to be unnoticed in my service to Srila Prabhupada. My most joyous memory is cleaning the Temple floor on my hands and knees. I did go from Myapura to Calcutta, but to see Srila Prabhupada. I did return to the USA and left ISKCON, who is Distadumna? I did talk with a few Sanyasis. At a senior age of 60 years I often think of retuning to full service in a Temple if I can clean the floors and avoid the gossip and controversy of who is right. Now you can say you heard from Audolomi dasa babaji. Haribol!!! Glad your still with us in more ways than one! Whatever happened in the past, you have that special history of being given babaji by Prabhupada – how unique! Maybe sometime you’ll accept it again and there will be no gossip. I hope your desires for seva are fulfilled. Now, I am wondering about all those stories that Brahma prabhu would tell in class at the San Jose temple or on his Radha-Damodara Bus. He was a very good story teller, but now I am wondering if maybe he didn’t embellish his stories a little just for effect? Just want to say thank you to Madan for his OP and thank you to everyone else who has followed up on this thread. It is nice to read everyone’s comments and perspectives. Must go cook the dinner but wanted to add that I do find Aindra’s silence on the book controversy (I hadn’t heard about any of it until now) admirable. Like, it appears he was just going to publish his book and deal with the consequences as they came and that, to me, is very non-political and renounced. Again, thanks for sharing candidly your thoughts here. I appreciate it. Babhru–I know that even death won’t do much for me, but yeah, that does seem to be the phenomena…definitely cheapens things. Should I have posted that here or should I have just waited to run into you in the laundry room? 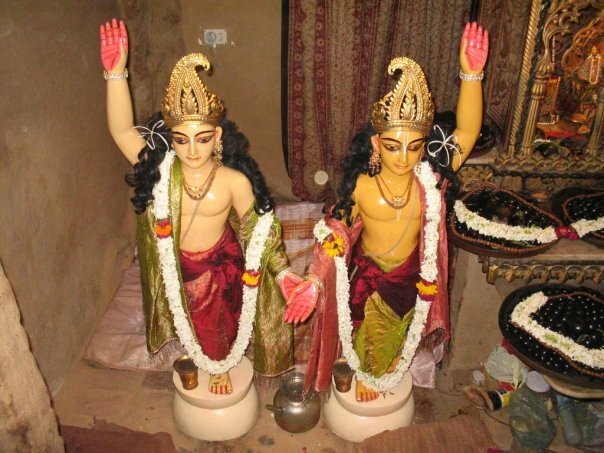 Everyone… take a look at this picture of Aindra Prabhu’s Gaura Nitai deities. If you do, you will understand how over the years his heart continued to soften in relation to the Lord, his sectarian consciousness began to embrace Krsna consciousness, and why harinama would slowly give himself to Aindra’s heart… Mahaprabhu, like Harinama is merciful. My thanks to the above Harmonist commentators and posters for bringing me back to reality. I had started to drift away these last few weeks, but reading these posts has rekindled my devotional sentiment. Especially Madan Gopal das’ lovely & lively exposition on his experience with Aindra Prabhu and the comment about the madhyam adhikari as being “plagued with religious doubt.” Illuminating !! But other than Madan Gopal das’ brief discussion of the relationship between Aindra Prabhu’s relationship with Iskcon authority, none of the commentators touched on what may very well turn out to be the core philosophical issue that Aindhra Prabhu was likely attempting to bring to the surface in his book, which is the role of the ecclesiastical institution in facilitating the spiritual progress of the individual practitioner living within its jurisdiction. And this is the only REAL duty of the institution: not to raise funds, birth gurus, increase membership, “manage” devotees, build temples, etc. After all, no institution can save us from repeated birth and death; only our individual perfection in bhakti and Krishna’s causeless mercy will eventually accomplish that. Of course I can’t pretend to know Aindra Prabhu’s mind, but now I can’t wait to read his book ! Of course I can’t pretend to know Aindra Prabhu’s mind, but now I can’t wait to read his book ! Oh it’s coming out, I hear there are boxes of them! So sad that we will not be able to inquire from the author. From what I knew of him in the past and from people who have very recently had his sanga, the cause of making the institution serve the highest purpose was something that Aindra had a burning passion for. You hear him consistently hammering away on this in the few classes he was allowed to give. I pray that this aspect of his legacy is remembered. He was not just a kirtan man, his kirtan was also preaching – to the devotees. Haribol! It is a very nice and inspiring article and discussion. Thank you! I think that ‘humanizing’ great Vaishnavas is very important, and not just only after their passing. Why? Primarily because this human side reflects reality and fact. And also because it is inspiring, showing us that despite some arguable flaws a person can still be an outstanding Vaishnava. When Vedic literature describes great devotees, that portrayal is very multifaceted and human. Think Mahabharata and the Pandavas. Do we think any less of them because their humanity has been exposed to us? I don’t think so. Devotees situated in this material world should not be viewed with material vision; in other words one should not consider them to be ordinary conditioned souls. The imperfections visible in their natures, such as birth in a low caste, harshness, lethargy and so forth, and the imperfections visible in their bodies, such as ugly features, disease, deformities and so on, are precisely like the appearance of bubbles, foam and mud in the Ganges. Despite such apparent pollution in the water of the Ganges, she retains her nature as liquified transcendence. Similarly the self-realized Vaisnavas always exist on the transcendental plane and one should not attribute material defects to them. Even if a person of very bad behavior worships me with undivided devotion, he is to be thought of as saintly, for he has the proper resolution. He quickly becomes righteous and attains lasting peace. O son of Kunti, declare it boldly that no devotee of mine is ever lost. In other words: one should not pretend these imperfections do not exist. But we should not hold these imperfections as a reason to disqualify someone as a great devotee and a liberated person. Furthermore, the imperfections may appears as ornaments in some cases to those who see that devotee with affection. Here is a link to the interview that Steven Rosen conducted shortly before Aindra Prabhu left his material body. It is perhaps worth asking if Aindra Prabhu is not revealing the whole story of his seva mood, since the quotes below indicate that he was indeed involved in distributing books, although his heart was very much drawn to kirtan. Swami Tripurari has stated above (in one reply) that Aindra Prabhu was not involved in the publishing or distribution of any books other than his own (solitary?) book. Is this accurate? Is there more to the story? AR: “So I contacted Vishnujana Maharaja and told him that I would join the Radha-Damodar party after the devotees at the temple came back from Mayapur. Unfortunately, news came back from the Mayapur Festival that Vishnujana Maharaja had left us – long story, as you know — and I was so disappointed. For many reasons. But Vishnujana Maharaja leaving meant that his harinama- sankirtan program would more or less collapse. And it did — the Radha-Damodar Sankirtan party came under the direction of Tamal Krishna Maharaja and Tripurari Maharaj, and the focus shifted to book distribution. SR: Oh, and you wanted to do harinama-sankirtan. So what did you do? AD: Right, so I was uncertain where to go and what to do. But because I was into book distribution, too, and I appreciated Tripurari Maharaja’s enthusiasm in that regard, I decided to join his Radha-Damodar bus. SR: This was an ambitious program to sell books. Hardly the more sattvik atmosphere of harinama-sankirtan. Note: AR above should be AD (Aindra das Prabhu). SR means Steven Rosen. It is amazingly intense and heartfelt. My only question thus far is if it is perfectly in line with Gaudiya Vaisnava Siddhanta. It is very high and deep exposition. Much more than I can ever dream of being qualified to consider with mundane intelligence. Yet, it is most definitely prose that is intended to inspire the most sincere souls to aspire for svarupa-siddhi and beyond. It leaves my conception of I and mine spinning in total dizziness. At the same time, the quality of the language used is so relishable at times that one cannot help but feel that the intelligence at its source was gifted to the author, rather than acquired by arduous study. Peeking into the culture that has produced this sadhu’s perspective must be a window into Radharani’s mercy. Unconventional scholarship is fascinating to witness in action because it operates outside of the boxes of conventional wisdom. I do realize that the book expresses some strongly controversial moods, depending on one’s angle of vision. Bhaktisiddhanta Saraswati coined the term “Brhad mridanga” in reference to the printing press. The mridanga of a kirtan can only be heard for a couple blocks but the books printed by the printing press can travel around the world. It is a dynamic form of kirtan instituted by Bhaktisiddhanta Sarasvati. Distributing books at airports allowed Mahaprabhu’s kirtan to literally spread around the world in a couple of hours. This is the genius of Prabhupada’s book distributors like Swami Tripurari. Huh? I thought sankirtan was transcendental/nirguna. He seems to be saying that sankirtan is more sattvik and that book distribution is rajasik. Perhaps I have misunderstood or he means externally they have some corresponding characteristics. Aindra served for a time as a book distributor on the RDTSKP bus that I managed in the late 70’s. I remember him as an enthusiastic devotee who struggled with a mind that took him way out there…At that time he had no position of leadership and wasn’t what anyone could refer to as being ‘down to earth’ in any sense. I was out of Iskcon by 1981–therefore I was surprised (and pleased) to see Aindra in a position of prominence when I visited Vrndavana some 22 years after I had last known him. Indeed he had found his place, and his way out there mind now appeared to be deeply Krishnized. That way out there Krishnized mind is displayed in the interview and shines brilliantly in what one might call his odd book of Krishna conscious revelations. Yet, the book leaves wondering….because devotees that I consider advanced like Prabhupada, Sridhara Maharaja, Swami, Narayana Maharaja and others just don’t write like that. So it would be nice to have some devotees of stature comment on the book because most people just don’t know what to think of it. I just want to leave a brief comment to let you know that there is a team working on an official biography of Aindra Prabhu, I am happy to be part of that team. It may take about another year maybe before the biography is out. Once the bio comes out we’ll release soon afterward a sort of commentary/explanation/demystification of Aindra’s book. A biography is an account of a person’s life (generally warts and all). A hagiography is a biography written by admirers that idealizes or deifies the subject. The internet already offers a few short hagiographies of Aindra, but what I would like to see is something that tells the details and truth about Aindra’s struggle with both Iskcon management and himself. It’s no secret that not everyone in Iskcon, particularly management, was always entirely pleased with Aindra. Management is about keeping everyone on schedule and productive which in Aindra’s case wasn’t always easy as he could be unreasonably rebellious and difficult. We can say now the problem was the fact that he wasn’t meant to be an Iskcon ducks in a row/cookie cutter brahmachari, and I agree, but a lot of time and struggle went by before he found a home at Krishna Balarama and became so revered. So not just his angels and visions, but his struggle (from all sides) should be told. Take a look at Sukavak’s book on Bhaktivinode Thakura. I remember one morning before Mangal artik I found Aindra asleep on the stairs going up onto the altar. It had to have been 1979 because it was when we still had the altar in Chicago up on the third floor. He was stretched out on the stairs fast asleep and in one hand he had a piece of some kind of nice cloth and in his other hand he had a pair of scissors. That was Aindra. When I knew him he was always absorbed in some service for Their Lordships and making something for Kishore-Kishori. I’m sure we don’t need to speculate or worry about his passing. In the Caitanya Bhagavat it is said, “One who smears cow dung in the temple of Visnu and draws colorful pictures on it happily resides in the abode of Visnu, where the residents look on him with welcome glances.” That’s exactly what Aindra Das Babaji was doing right before his departure and anyone who has the good fortune to visit Krishna-Balarama Mandir in Vrindavan should be sure to look at the beautiful bas-relief montage he put together with cow dung and beautiful pictures on the stairways and landings leading up to the brahmachary ashrama overlooking the Gurukula. I hadn’t seen Aindra in over twenty years but when I got to India in March of ’07 I fell at Aindra’s feet and thanked him for saving my life in ’80 by insisting that I do deity worship. I said, “Aindra, I’m on my way out to the airport to do books. I don’t need to do deity worship.” I was so puffed up. The next day the same thing happened and then on the third day I grudgingly gave in. The deity worship was the one thing that helped me through all the ISKCON crazy struggles that developed after Srila Prabhupada left. Aindra Prabhu had me bathe and dress the small Radha Krishna deities in Chicago from ’80 until I left Chicago in ’95. By Aindra’s mercy I did that service without interruption for fifteen years. I’m eternally grateful. Thank you for sharing this inspiring story Prabhu! Thank you for writing this article Prabhu, it glorifies a great soul and has created an online sanga in remembrance of one of the most inspiring vaisnava personalities in my life. Aindra Prabhu’s book is pure nectar, and seems to bring me much relief. Were it not for his penetrating commentary on the reality of Gaudiya vaisnava siddhanta vs the rampant reality of externally oriented institutionalised ecclesiastism, I think I would hold much less hope for my ongoing practice of this most profound spiritual tradition… He says it like it is.